The role that intuitions have played in philosophy will be the focus of a Syracuse University Humanities Center symposium this week. Edouard Machery, professor of history and philosophy of science at the University of Pittsburgh, will explore the implications of the intuitions that philosophers have and do rely on during the “Experimental Philosophy and White Male Intuitions” symposium. Machery will give a public lecture on Thursday, Feb. 13, at 4 p.m. in the Kilian Room, 500 Hall of Languages. An HC mini-seminar will be held Friday, Feb. 14, at noon in 304 Tolley Humanities Building. These presentations are co-sponsored by the Department of Philosophy in The College of Arts and Sciences. HC Faculty Fellow Kevan Edwards will lead and moderate the mini-seminar. Machery will discuss a recent movement called “experimental philosophy.” Proponents criticize traditional “armchair” philosophical methods and call for a more empirically engaged approach. A standard complaint is that a key philosophical claim has been based largely on what cross-cultural investigation confirms to be the intuitions of a restricted demographic (e.g., white men). Machery is a leading young figure in philosophy of mind today. 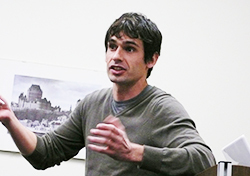 He was the winner of the 2013 Stanton Award, bestowed by the Society for Philosophy and Psychology (SPP) to “a young scholar in philosophy or psychology who has begun making significant contributions to interdisciplinary research.” Machery is a member of the Center for the Neural Basis of Cognition and author of “Doing Without Concepts” (OUP). The symposium is one of many symposia offered by the Humanities Center this semester, bringing several renowned scholars to campus to explore a wide range of contemporary issues. For more information, visit http://www.syracusehumanities.org.